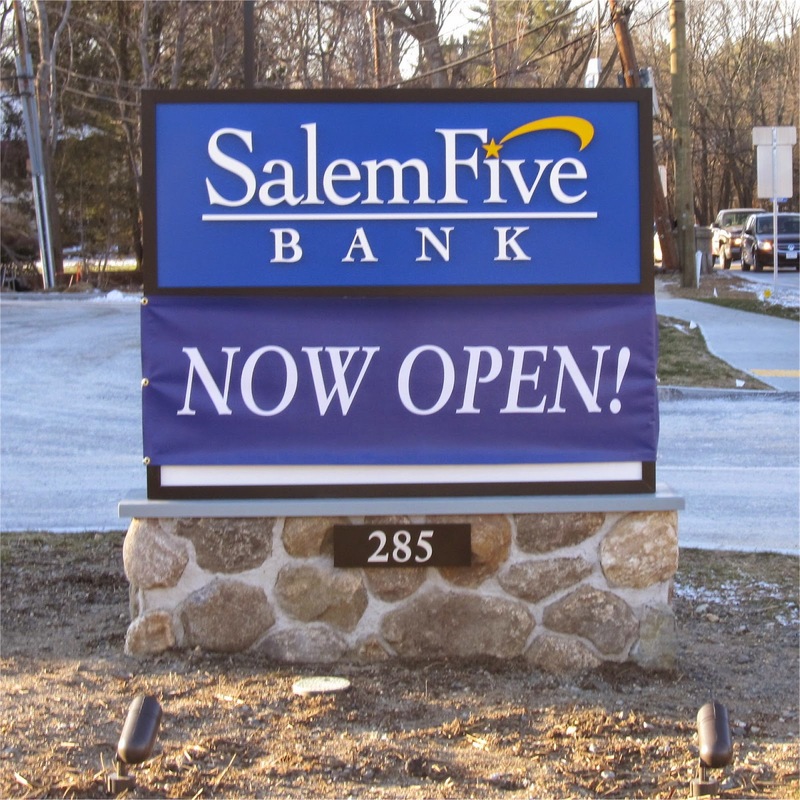 Salem Five Bank is now open at 285 Great Road, the former site of the Bedford Travelodge Motel. I recently spoke with Scott Fisher, Vice President, Market Manager for Business Development at the Bedford Branch. According to Scott, Salem Five has been around since 1855. 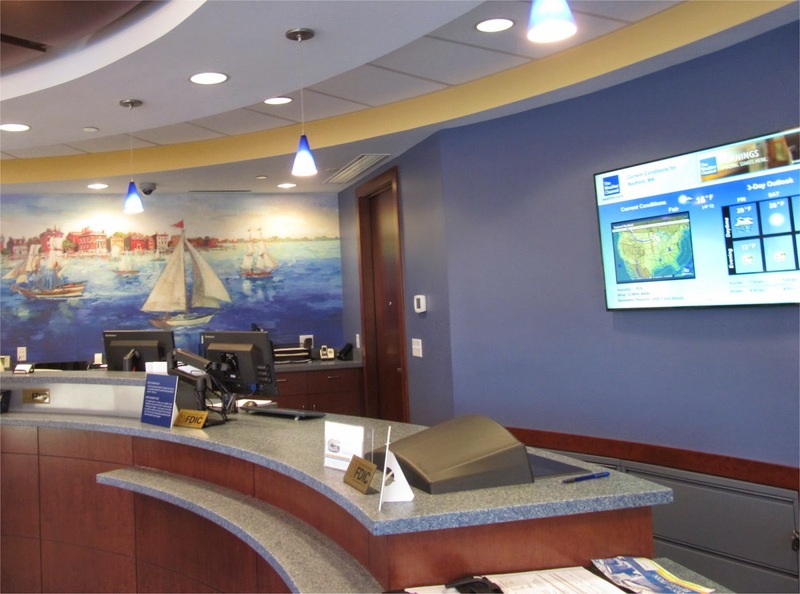 It's a community bank that until recently was focused on the North Shore. A few years ago the Bank decided to expand in to Middlesex County and opened branches at the Burlington Mall and in Concord. These were doing well so they thought it made sense to open another branch between these locations. They settled on Bedford. 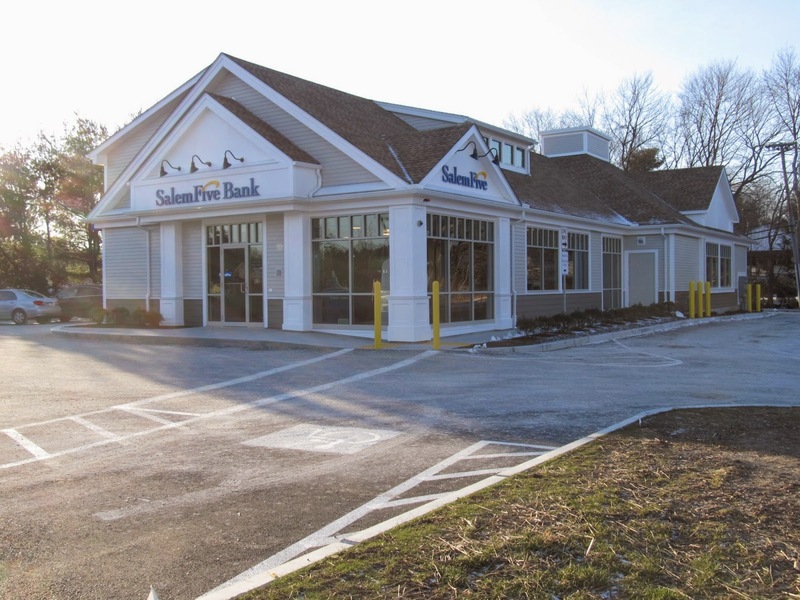 The Bank now has 29 Branches and plans to continue to open additional branches in the next few years (their newest branch is set to open soon in Needham). The Bank offer a full range of consumer and business services. As Marketing Manager, part of Scott's job is to interact with the community including local businesses. Scott mentioned that they provide special banking benefits to employees of companies who have an account with the Salem Five. The branch features a drive through along with heated sidewalks. There is an additional 1600 square feet of retail space available for lease in the building. The Bedford Branch at around 2500 square feet, is a little smaller than the traditional bank branch. Salem Five recently updated it's bank designs and in doing so eliminated teller lines, giving the bank a more sleek modern appearance. According to Scott, six people currently work in the branch including an in-house financial consultant and a mortgage specialist. While the Bank's soft opening was on December 11th, they spent the past few weeks getting involved in many civic organizations in and around Bedford. In addition, they recently distributed free Apple Pies to many businesses and households in Bedford. The Bank has scheduled a grand opening celebration for January 31st and February 1st. According to Scott, the theme will be a winter wonderland with the bank turning a portion of their parking lot in to an ice skating rink. The bank plans to have ice skates available for anyone who wants to skate along with a Hot Chocolate, Hot Cider and Cookie Bar for anyone who stops by. 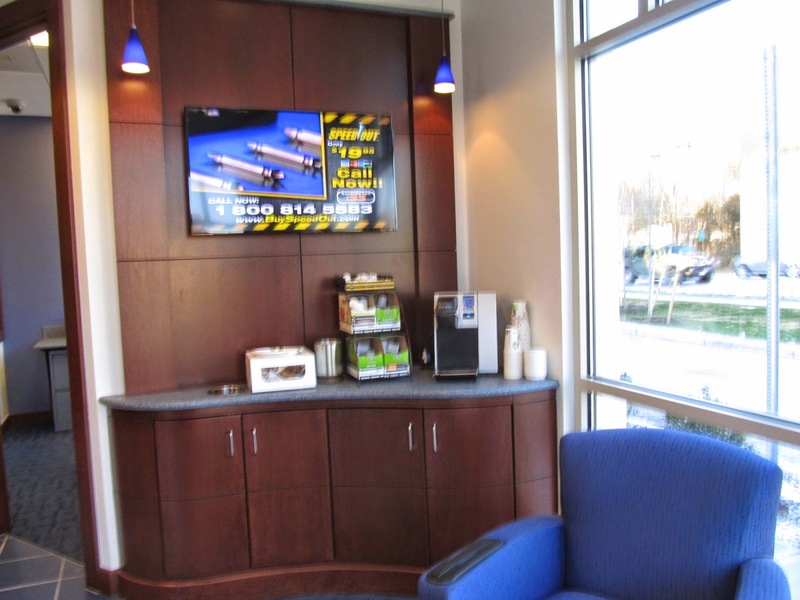 The Branch includes a ' Take Five Lounge' with a television along with free coffee and tea. Along with their traditional banking services, the bank has developed a interactive loyalty program featuring Dustin Pedroia designed to teach kids who open an account, about investing and saving money. Salem Five is also looking in to rolling out more mobile services such as Apple Pay. The ideas of staying open a few extra minutes seems to be a smart one. It presents a positive customer experience to people versus business that try to rush you out before closing. For example at Stop and Shop, 30 minutes before they close, they usually announce they will be closing in 30 minutes over the loud speakers. They then proceed to repeat the announcement every five to ten minutes almost like a countdown clock. The past few years have featured in increase in the number of banks in Bedford and surrounding areas. Landlords tend to favor banks as tenants as they almost always pay their rent on time. In Lexington, the town is considering a moratorium that would prohibit new bank branches from opening in Lexington Center. What are your thoughts on that? Both Ken's Deli and Red Heat Tavern have applied for the town's last available All Alcohol license. Ken's Deli which opened almost 2 years ago at 72 Great Road currently has a Wine and Beer license. They are looking to expand in to the space previously occupied by Wicked Good Frozen Yogurt (of which they were a co-owner). As part of this expansion, they plan to create a full service dining room in the new space and so would like to upgrade to a All Alcohol license. As previously reported, Red Heat Tavern is looking to move in to the new building under construction next to Marshall's in Bedford Market Place. They have an existing Red Heat Tavern restaurant in Wilmington and Bedford would be their second location. Red Heat Tavern's legal notice for the license application was published December 18th with Ken's legal notice for their application getting published on December 26th. Massachusetts Liquor License quotas establishes 1 full alcohol license for every 1,000 in population according to the latest federal census. The latest census information updated on 2/14/14 showed 14,503 people in Bedford so that gives a total of 14 licenses. The town does have the option to petition the state to issue more licenses. This was most recently done in Burlington which was able to get 10 additional licenses and Watertown is in the process of requesting 15 additional licenses. If the town does pursue this option, it would take some time before the new licenses actually become available. In Massachusetts there is an ability to transfer licensess. For example restaurant A could transfer the license to restaurant B in exchange for compensation. The transfer would still have to be approved by the Selectman. The Selectman meetings usually provide an opportunity to provide public feedback so if you favor one restaurant over the other, I would recommend attending the meeting or sending a note to the Board of Selectman via their online contact form, letting them know your thoughts. The Staples (store #1652) at 297 Great Road in the Great Shopping Center is expected to close at the end of February. Staples closed about 175 stores in 2014 and is planning to close an additional 50 or so stores in 2015 including the Bedford location reducing the total number of stores in the United States to under 1600. Many items in the store are currently on clearance as the company is trying to clean out remaining inventory. It's not known if employees at the Bedford location will be transferred to other locations. This doesn't seem to come as a surprise. Compared to the Burlington store, this Staples always seemed a lot less busy. With the closing of Staples, there is quite a bit of retail space available in the Great Road Shopping Center. What type of stores or restaurants would you like to see? For more details on Red Heat Tavern coming to Bedford, I recently spoke with Kevin Harron, The CEO of Burtons Grill Restaurant Group which also owns the Red Heat Tavern brand. According to Kevin, the idea of Red Heat Tavern began in 2008 during the last recession. While Burton's Grill was doing well, the management team saw a trend in less people eating out and wanted to come out with a more casual concept that still had high quality food made in a scratch kitchen but at a more moderate price point than Burton's Grill. The team wanted an open kitchen and looked around for an charcoal oven that would enhance the natural flavor of their food. They finally found the Jospher Charcoal Oven which combines elements of a grill and an oven. They then ordered one of the ovens to test. The high temperature oven, which uses hardwood charcoal gave off a red heat from the coals so they decided to go with the name Red Heat Tavern. It took several years to fine tune the concept and by the time they were ready to open the first restaurant in Wilmington last year, the economy had recovered but they still found a large demand for high quality food at a more moderate price point. Shortly after opening, they realized the concept seems to work well so they set about looking for a second location. Bedford was seen as a strong community with a good income level. The restaurant group also liked the fact that Bedford adds a lot of office workers during the day in nearby office parks. With a lot of new restaurants opening in Burlington, the restaurant group thought it would be good to have a location in Bedford so residents could stay local and not have to drive over to Burlington or Lexington. Bedford Market Place was being renovated and it was thought that the existing Whole Foods would drive a lot of traffic. Construction on the new building has begin. The restaurant is expected to open later this year. The new building which will be next to Marshall's, is expected to have about 160 indoor seats as well as a outdoor patio which should seat around 30. Assuming their liquor license gets approved, the new restaurant is projected to open this fall. The new restaurant will include an outdoor patio. It's good to see one of the new buildings under construction at Bedford Market Place already has a tenant. Burton's Restaurant Group seems to have come up with a good idea on how to handle food allergies. When a guest with a food allergy orders, their meal is cooked with special color coded cooking utensils specific for each allergy and then served on to a different shaped plate. This make it easy for everyone in the kitchen and wait staff to spot rather than having to rely on word of mouth or a special print out. Red Heat Tavern, which has an existing location in Wilmington that opened in March 2014, is looking to open a second restaurant in Bedford at 150 Great Road. The company, which also owns Burton's Grill, has applied for a restaurant and an All Alcohol License in Bedford. 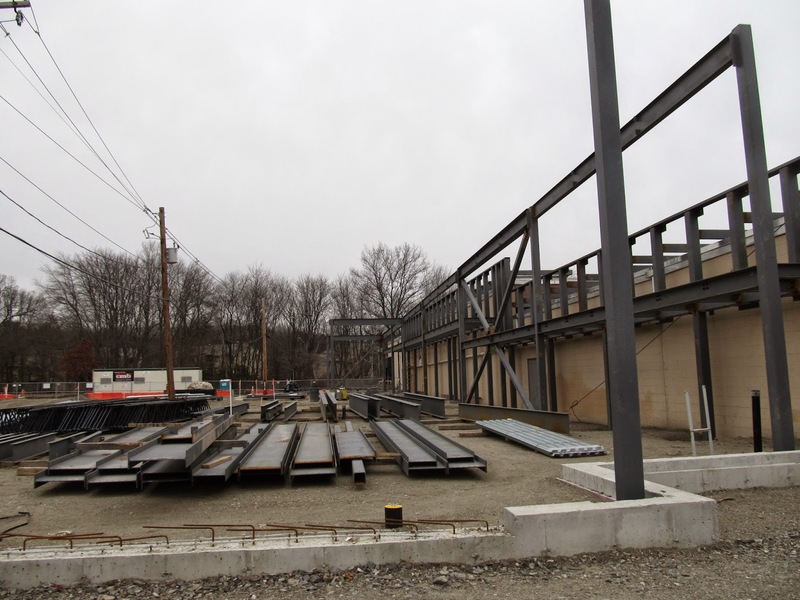 The restaurant would be located in the new building under construction next to Great Road Marshall's in Bedford Marketplace.